Phil Carlucci, author of the new Arcadia book Long Island Golf , challenged you to solve this holiday weekend's Mystery Foto. How is this image related to the Long Island Motor Parkway? What is the approximate date of this image? According to Phil Carluci, the date is sometime between 1932 and 1933. What is this image? It is not an aerial. 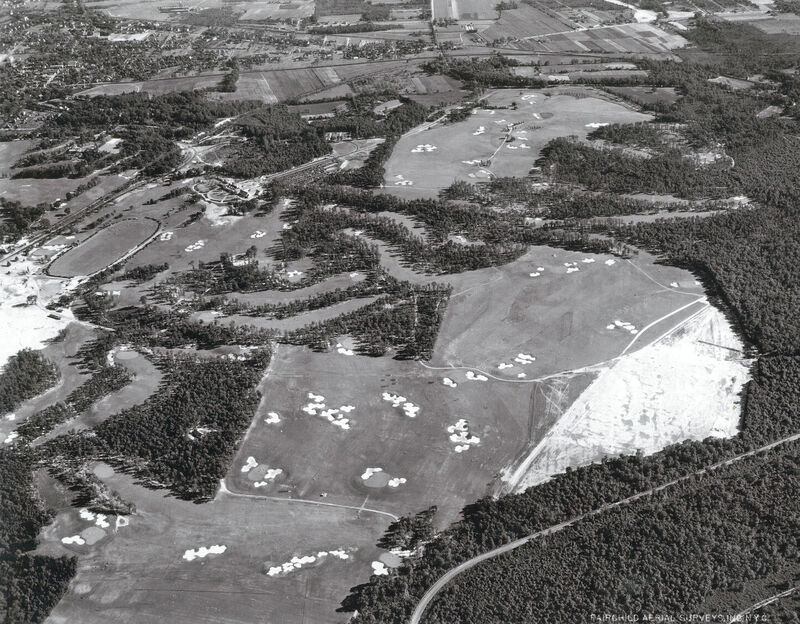 This was a WPA "cartographic map" model of the proposed golf courses for Bethpage State Park. Some of the features in the model were never built; including several of the roads and the large sand traps on the Black's Hole #1 fairway. The image is courtesy of the Tillinghast Association. Gary Hammond, former Museum Registrar for Nassau County Department of Parks and Recreation, provides great insight into Bethpage State Park in the below comment. Congrats to Joseph Oesterle, Greg O., Robert Greenhaus, Frank Femenias, Tim Ivers, Brian McCarthy, Art Kleiner, Steve Lucas, and Gary Hammond for identifying Bethpage State Park and the Long Island Motor Parkway. Kudos to Art Kleiner and Gary Hammond for correctly identifying the image as a WPA model from the 1930s. Thanks Phil Carlucci, I really enjoyed your wonderful book! The model shows the Motor Parkway as it turned east and then north again. Several of the roads depicted here were never built. Look closely and you can see the model depicted the Powell Avenue Motor Parkway Bridge on the left. Bethpage State Park. LIMP runs from lower left to upper left. 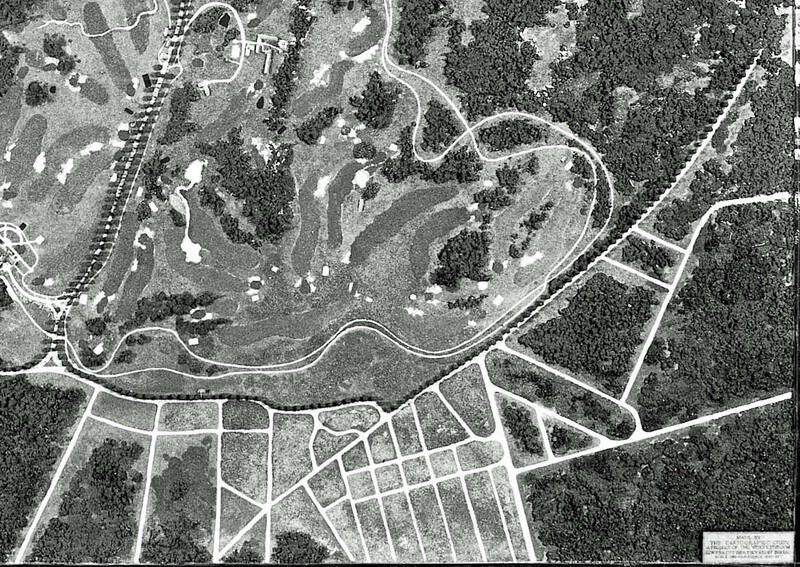 This looks to be a map of the Bethpage golf course with the LIMP on the left side of the photo pre-1959 when rt 135 construction started, likely in the 30’s. 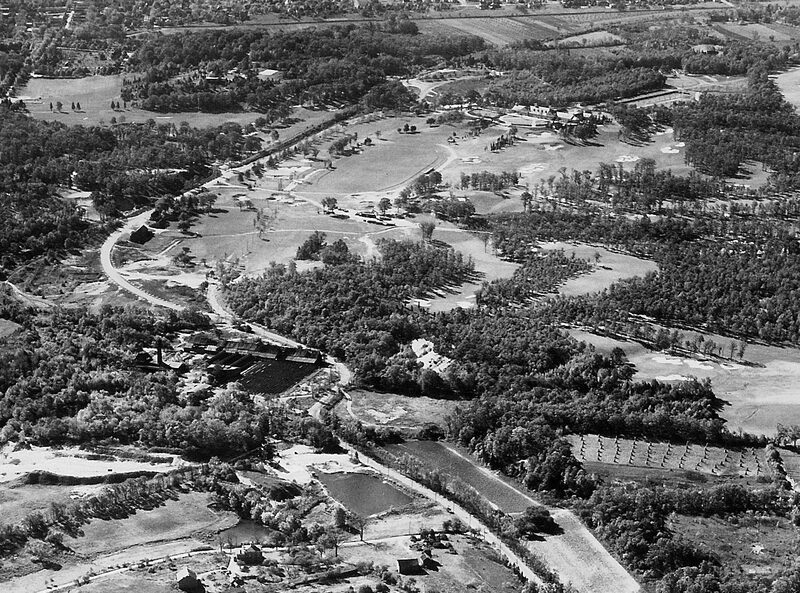 Bethpage State Park in Old Bethpage (formerly Bethpage), NY, circa 1938. The L.I. Motor Parkway can be seen on the left side of the frame. Looks like a map or scaled model layout of Bethpage Park (Central Park) and golf course in Bethpage, north up. Motor Pkwy is the vertical roadway furthest left, perpendicularly crossing Powell Ave. This map/layout is dated 1908-1950s with straightened, tree-lined Plainview Rd still visible north of the LIMP. Ted: Best wishes to you and family at your new home in sunny Virginia. Many historical areas and structures survive and well maintained in Williamsburg. What happened? I didn’t think you were going to post this until Monday, I guess because I really had no answers to talk about did I? Happy Fourth again. I’m going into town to watch the fireworks in Historical Williamsburg, about 15 minutes from the apartment. 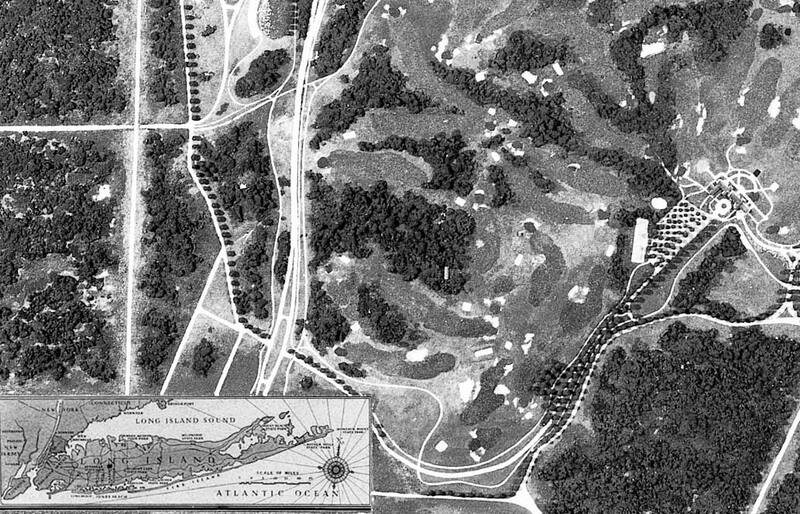 Overview (drawing) of the Bethpage State Park golf courses looking north. to be running top to bottom on the left and five 18 hole courses are showing. The remains of the LIMP appear near the rectangular polo field on upper left. Relation to LIMP: LIMP is at the left of this map, running north. It then continues east thru BSP, and north of the park. This looks to be a map drawn up to represent the proposed BSPkwy Ext that would’ve continued north to the present Caumsett State Park. I printed this image full size to mark out existing roads. LIRR main line is not shown, would be south of Stymus Ave.
How is this image related to the Long Island Motor Parkway? - Motor Parkway runs along the left side (bottom to top) and then diagonally from left to right and then north again. What is this image? It is not an aerial. Cartography map created by the Cartographic Program of the Works Program Administration (WPA). 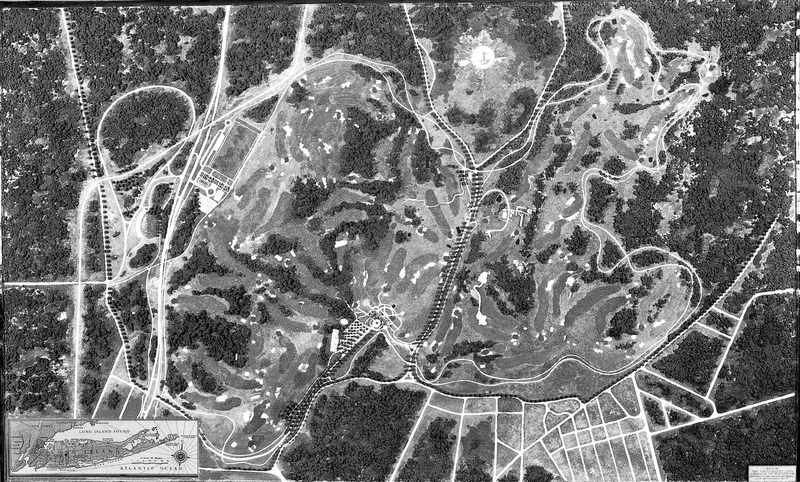 It sure looks like a lot of golf course or courses in the image so I’ll guess that it’s some kind of mock-up or diagram for Bethpage State Park from around 1957 that was prepared for the addition of the yellow course. This was about the same time that Robert Moses was designing the nearby Wantagh (later Seaford) Oyster Bay Expressway so that could be connected. If I’m close to being accurate, then we’re in the vicinity of Dead Man’s Curve of the LIMP on the left side of the image. Since everyone else has creative titles should I be calling my answers Hammond’s Historical Happenings? It appears to be a WPA built diorama of the proposed Bethpage State Park, done in the 1930’s. It is somewhat similar to one in the Nassau County Courthouse showing all of LI. It appears to have a label in the lower right corner stating it is a WPA project. Around 1905 a Texas railroad tycoon named Benjamin Franklin Yoakum (1859-1929) started buying up property in the Farmingdale / Central Park / Bethpage area, and creating an estate which when completed amounted to over a thousand acres. Yoakum raised prize cattle, chickens and pigs, and used the name Tywacana Farms Poultry Company to sell eggs, chicks, breeding stock, and patented boxes for shipping eggs and chicks. He wrote articles for popular magazines, and lectured promoting modern agricultural methods and railways. He also invested in local business, and helped establish the N.Y.S. Institute of Applied Agriculture, the “Aggie” school in 1912. Yoakum also established on his property the private Lenox Hills Golf Club, which was an 18-hole golf course, designed by well-known golf course architect Devereux Emmett. Complete with a clubhouse it opened on Decoration Day, May 30, 1923. He also built a building for the Boys Club of Farmingdale in memory of his wife, Elizabeth Bennett Yoakum, in 1926. After his death in 1929 the estate became the center of a controversy as to its fate. This wouldn’t be resolved until 1934 when it became Bethpage State Park. Yoakum’s property was ideal for Robert Moses’ purpose as a state park. Besides the existing golf course, the property was hilly, and wooded, with a pond, had service buildings left over from the estate era, it even had a private water system with a 100,000 gallon elevated water tank. It could be developed into a complete recreational facility for golf, tennis, polo, horseback riding, baseball, and picnicking. The problem was the money needed for acquisition, as the country was in the midst of a depression. The property straddles the Nassau/Suffolk County line, is located in the Towns of Oyster Bay and Babylon, geographically in Farmingdale, Bethpage, and Old Bethpage, although technically its post office address is Farmingdale. A unique proposition arose when it was suggested that New York State, the Town of Oyster Bay, and Suffolk County join forces to acquire the site. Oyster Bay and Suffolk both gave monies to secure an option to hold the property and allow the public access as of the Spring of 1932. Of course the question was what to name the new park. 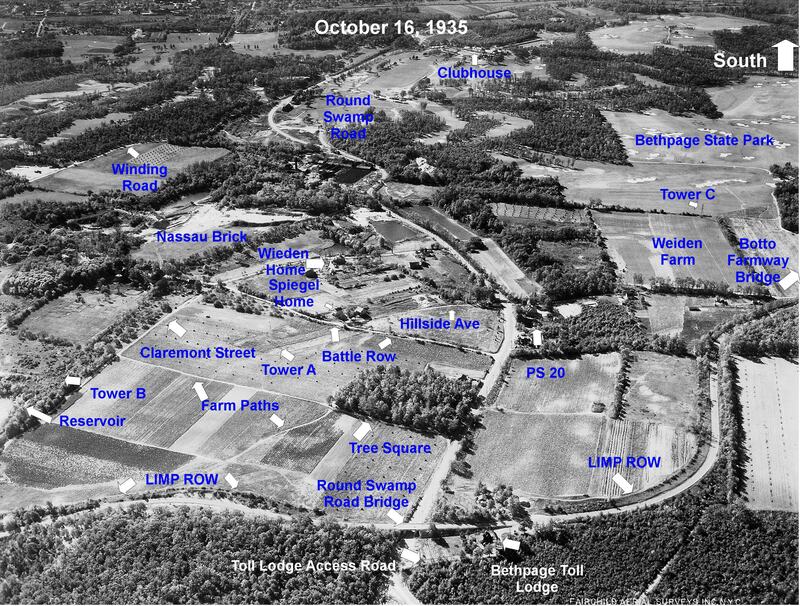 Fortunately, Nassau County Historian and Farmingdale resident Jesse Merritt had suggested back in 1931 naming it Bethpage Park, a suggestion that was accepted by the Long Island State Park Commission in April 1932 just prior to its opening. On August 26, 1933, Chapter 801 Laws of New York creating the Bethpage Park Authority became a law. It was specifically designed so as to allow the Authority to issue bonds for the acquisition, improvement and operation of the state park. 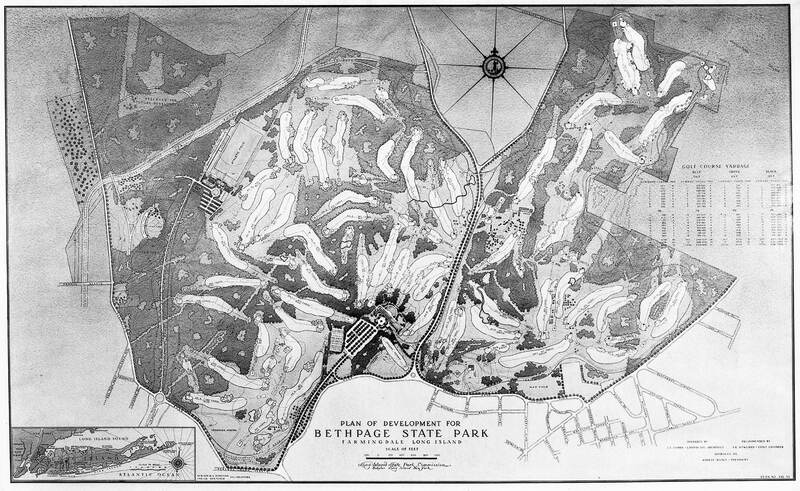 Considered the largest piece of property under one private ownership in Nassau County, the cost for the 1,368 acres was $1,000,000, with the title closing on May 18, 1934 – thus Bethpage State Park was officially born! Through the WPA, a new clubhouse was built, three additional golf courses were built, also the polo field was constructed. An idle furniture factory in New York City was taken over and produced all the furniture for the clubhouse, while steam tables, plate warmers, coffee urns and other kitchen equipment was turned out at the Park Commission shops in Babylon. The old Lenox Hills golf course became the Green Course, while A. W. Tillinghast designed the new Blue, Red, and Black courses. The new clubhouse and three of the golf courses opened on August 10, 1935. Hundreds of workers were given employment by the many phases of construction, both on and off site, including the building of Bethpage State Parkway with its five ornamental stone-faced concrete bridges. 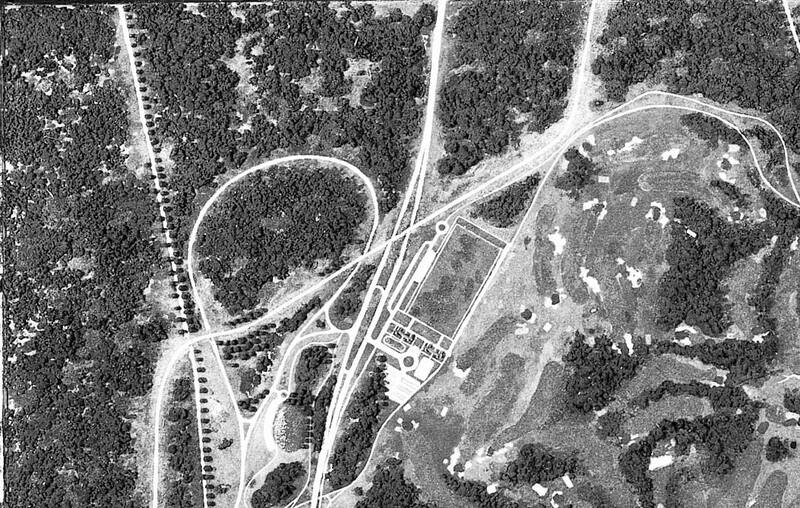 Designed to connect Southern State Parkway to the state park it was dedicated November 14, 1936. I say that this is a proposed layout because some of the roads did then exist (and still exist today) such as Quaker Meetinghouse Road, and Round Swamp Road. However it shows the proposed extension of the Bethpage State Parkway north which didn’t happen. 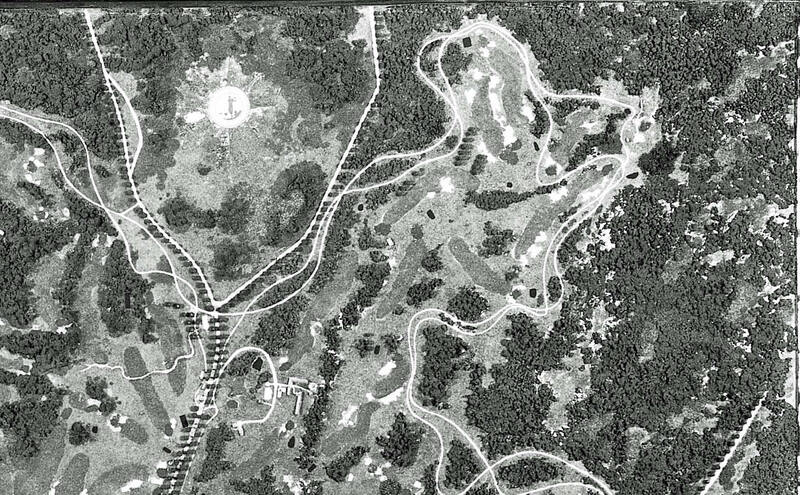 It does also show the LIMP running on the top or north side of the “map”, just above the Polo field. 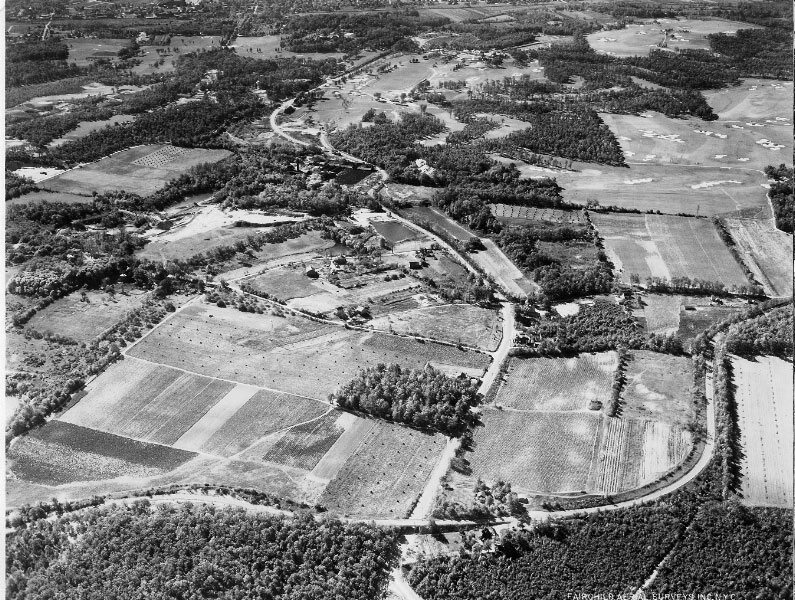 In addition it shows the bridal trails and the “service yard” of the Park, those buildings formerly being part of Benjamin F. Yoakum’s estate. Is it a composite of golf courses on Long Island? Thanks Frank. You are so right, this is a very well maintained historical area, this is one of the reasons we moved here, always something going on during the holidays and plenty to see and do at your leisure, not like N.Y.at all, nice people, polite, helpful and friendly. Here’s a link to a web page showing historical photos of Bethpage golf area. 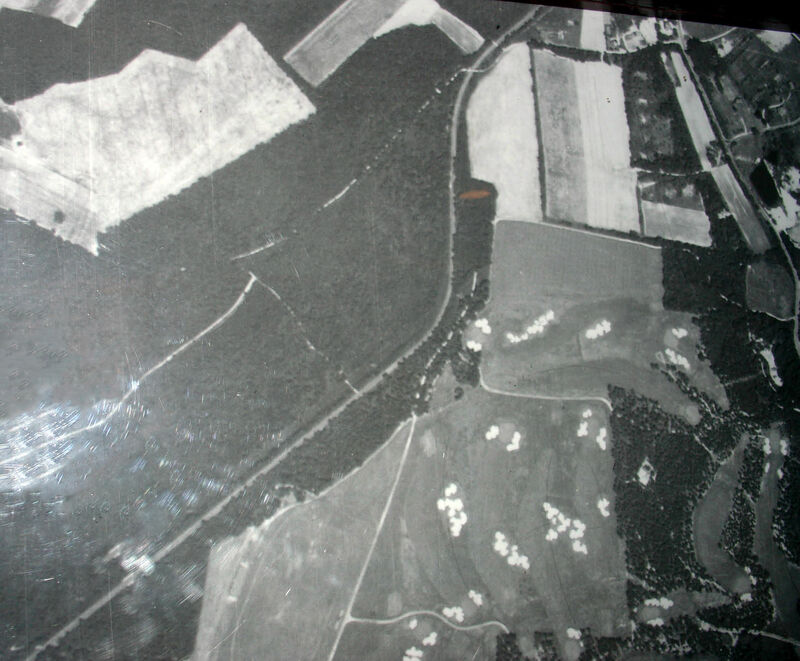 One picture shows what it says is an aerial view circa 1938 which is very similar to the mystery photo. Based on answer of the date on this. It looks like the same model.